An exhibition re-imagining our relationship to fashion, textile design, and computational technology as an interactive media. How can technology and fashion inform one another to help us better understand our world? Wearable Media presents Future Textile Library, an exhibition that explores the intersection of fashion, e-textile design, and computational technology. On view are innovative sartorial works that showcase the potential of smart apparel and reimagine the body’s relationship to fashion and technology as an interactive media. Premiering at Future Textile Library is AudRey, a garment that combines augmented reality, 3D printing technology, and analysis from Instagram to reveal the wearer’s digital “aura.” Also on view is Project Reefstone, a garment that reflects global warming’s effects on coral reefs through fabric panels laser-cut according to global temperature index, and Ceres, a jumpsuit that vibrates based on the frequency and distance of near-Earth asteroids. Download the press kit here and check out our documentary video produced by EdLab. 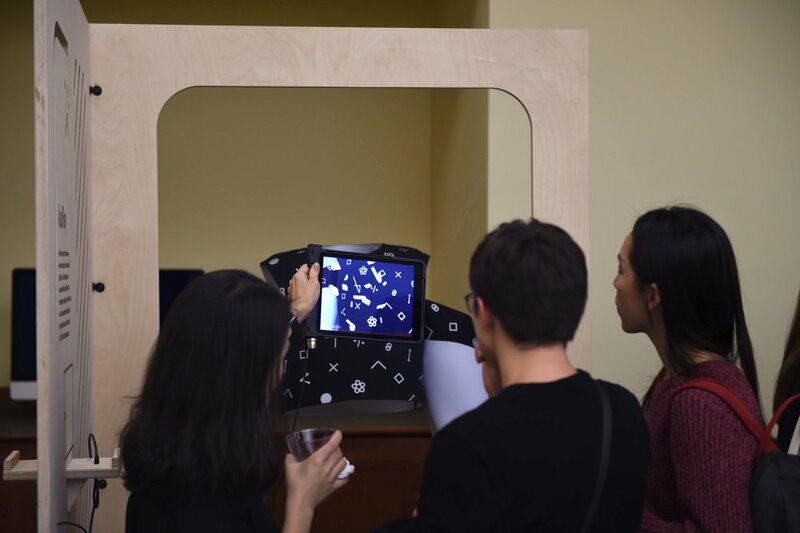 Wearable Media’s “Future Textile Library” runs October 21–December 22, 2017, at EdLab, Teacher’s College at Columbia University. This exhibition has been created in collaboration with Jean Chandler at Womanufacture, and with HEISEL, a design lab for 3D-printed textiles. Wearable Media is hosting a panel discussion on October 27, 2017, including a diverse group of women working in the field of fashion technology, textile design, and anthropology. The panel will open conversations about the current technologies applied to e-textile design, as well as how human behavior shapes our surroundings through clothing, culture and technology. This is an introductory course in which students will gain an understanding of the circuit technology used in clothing design to create e-textiles. Students can expect to come away with a basic knowledge of completing circuits, conductivity, and resistance. During the workshop, students will learn how to integrate these technologies and materials to design an interactive t-shirt. This workshop will teach the basics of creating wearable design with data. Students will learn how to collect data and integrate and transmit this information to create smart apparel via sensory technology, Arduino programming, and web development. By the end of the workshop, students will have developed a wearable e-textile swatch that collects data from the wearer’s body movements and then visualizes the data on a web app. This workshop will explore the relationship between sound and textiles, in the form of a kinetic e-textile swatch. Students will learn how to generate movement in textiles using magnets and copper wire, as well as mic sensor to capture sound which actuates movements. Preprogrammed wearable microcontrollers will be provided for sound input, and the students will be primarily learning how to physically construct, sew, and embed kinetic components into the textile. By the end of the workshop, students will have developed an e-textile swatch that can kinetically move to sound.